One of my all time favorite trends right now is animal print. 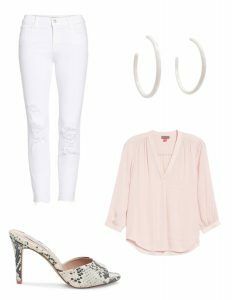 I love that it can be treated as a neutral and can really add that extra style to an outfit. The hard part about animal print is sometimes it can be over bearing or over done. 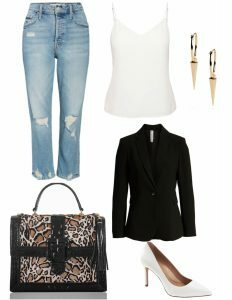 So if you aren’t someone who wants to rock a leopard blazer or snake skin pant, no worries there is still multiple ways to hop on the animal print train. The first is the main piece of your outfit being animal print. As I stated above this would be an item like a blazer, pant, or dress. This is for you fashionista’s out there who love print and being a little more bold. In the outfit I styled below you will notice that the rest of the pieces in the look are very subtle compared to the animal print pant. A more subtle approach is to wear that animal print in your shoe. This can be a fun way to add a fashion forward touch on a look. I also love how it gives the overall outfit that extra pop. Instead of a pop of color it is a pop of print! Would you rather keep your shoes more simple? Well, you can add that animal print into an accessory such as a handbag, belt, scarf, or even an earring. Again this is a great way to incorporate a trend without going overboard or making it too bold of a statement (especially financially). See, I told you there are so many ways to style animal print! Which way is your favorite? I would absolutely love to hear. Feel free to drop a comment, email, or DM me with your favorite way to style animal print!